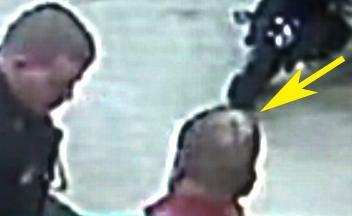 Viewers can decide for themselves, but reviewing the video, rather than isolating single frames, seems to pretty clearly show that what The DC identifies as a possible “laceration” is actually a dark spot created by variations in the density of Zimmerman’s hair, the curvature of his skull, and the lighting and angle of the shot. That spot on his head is visible and well-lit in other spots on the tape, but nothing is visible. Lacerations don’t disapppear depending on how you light them. Still, you have to give The Daily Caller credit for being thorough. Actually, a review of The Daily Caller’s coverage of the Trayvon Martin story shows a pattern of a certain kind of thoroughness. So let me get this straight. An overzealous neighborhood watchman of Hispanic descent shoots an unarmed black kid, and white culture is to blame? That seemed to be the argument in Michael Skolnik’s opportunistic, perversely reasoned, poorly written viral column about the death of Florida teen Trayvon Martin. Then CNN and MSNBC happily picked up the thread and sped the argument forthwith to Crazyland. Now that Trayvon Martin had their attention, The DC quickly distilled the voice of Trayvon Martin’s millions of supporters: the dozens-strong New Black Panther Party. The next day, they ran a story that implied that President Obama commented on Trayvon Martin’s killing because of pressure from that same group, but have since thought better of it, apparently, editing the piece to make it less race-baitey. * New Black Panthers no-show at planned Trayvon Martin rally outside Sanford, Fla. police dept. * Is momentum in Trayvon Martin case swinging toward George Zimmerman? As you can see, The Daily Caller was very thorough when it comes to covering Al Sharpton riling up black people, or Jesse Jackson showing up late, or President Obama being a bad, bad man, or George Zimmerman telling his side of the story and gaining “momentum.” They were so thorough that they even managed to work communists and Father Pfleger(!!!) into their coverage, and obtain the expert legal opinion of Rep. Ron Paul (R-TX). They’ve also been very thorough about conducting an internet grave-robbing, posting two rounds of tweets from the slain teenager’s closed Twitter accounts. So, what’s missing from those 45 Trayvon Martin articles? Well, there’s not a single headline devoted to Trayvon Martin’s parents, or to his attorney Benjamin Crump, or to Trayvon’s girlfriend, the only living witness to the first contact between Trayvon and Zimmerman. But they got Father Pfleger. They got the communists. They got Al Sharpton and Jesse Jackson and President Obama but good, with over a quarter of their Trayvon articles. George Zimmerman deserves his day in court, which is what all of these protests have been about. Hopefully, if and when he gets it, that court is a little more thorough than The Daily Caller was, or the only person in danger of going to jail will be Al Sharpton.